This is a period style, smaller version of the 160 type mirror for dashboard / scuttle mounted use. These mirror heads have plain glazed mirrors and we have re-engineered the base securing screw area to incorporate a larger diameter conical headed fixing screw with a milled flat section to the thread so they are now compatible for use with our Lucas style triangular mirror brackets. Above is a photo of one of our brackets with mirror head and in its rightful place on a K3. They were also fitted to the Q type and seem to be the popular part for Q (T) recreations. 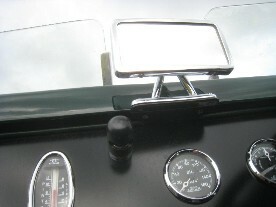 Other associated products include scuttle and horn button mounted mirrors.